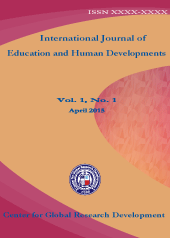 International Journal of Education and Human Developments (IJEHD) is a Bi-monthly online, peer-reviewed and open-access journal which is published by Center for Global Research Development (CGRD). Center for Global Research Development is an independent virtual Research Center has been working for creating and nurturing talents in USA and Bangladesh since its inception. CGRD delivering supports and services to education and research in all over the world. Date of Publishing: IJEHD is inviting papers for Vol. 1 No. 3 which is scheduled to be published on November 30, 2015.